Last month, one of my colleagues got a data set in Excel, and he was banging his head to clean it. Since I was the only one in the office at that wee hour, he asked me if I could help. I used a simple technique using Find and Replace in Excel, and his data was all clean and polished. He thanked me, packed up, and left office. He thanked me, packed up, and left office. Excel Find and Replace feature is super powerful if you know how to best use it. Find and Replace in Excel can save a lot of time, and that is what matters most these days. In this blog, I will share 4 amazing tips that I have shared with hundreds of my colleagues in my office. The response is always the same – “I wish I knew this earlier. It could have saved me so much of hard labor”. Sometimes when you work with a lot of formulas, there is a need to change a cell reference in all the formulas. It could take you a lot of time if you manually change it in every cell that has a formula. Here is where Excel Find and Replace comes in handy. It can easily find a cell reference in all the formulas in the worksheet (or in the selected cells) and replace it with another cell reference. For example, suppose you have a huge dataset with formula in that uses $A$1 as one of the cell references (as shown below). 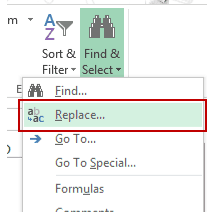 If you need to change $A$1 with $B$1, you can do that using Find and Replace in Excel. Select the cells that have the formula in which you want to replace the reference. If you want to replace in the entire worksheet, select the entire worksheet. Go to Home –> Find and Select –> Replace (Keyboard Shortcut – Control + H). Find what: $A$1 (the cell reference you want to change). Replace with: $B$1 (the new cell reference). This would instantly update all the formulas with the new cell reference. Note that this would change all the instances of that reference. For example, if you have the reference $A$1 two times in a formula, both the instances would be replaced by $B$1. This is a cool feature when you want to replace existing formatting with some other formatting. For example, you may have cells with an orange background color and you want to change all these cell’s background color to red. Instead of manually doing this, use Find and Replace to do this all at once. Select the cells for which you want to find and replace the formatting. If you want to find and replace a specific format in the entire worksheet, select the entire worksheet. Click on the Options button. This will expand the dialogue box and show you more options. Click on the Find what Format button. It will show a drop-down with two options – Format and Choose Format from Cell. You can either manually specify the format that you want to find by clicking on the Format button, or you can select the format from a cell in the worksheet. To select a format from a cell, select the ‘Choose Format from Cell’ option and then click on the cell from which you want to pick the format. 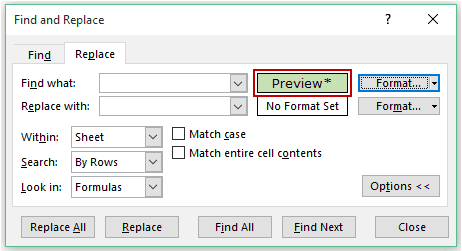 Once you select a format from a cell or manually specify it from the format cells dialogue box, you will see that as the preview on the left of the format button. Now you need to specify the format that you want instead of the one selected in the previous step. Click on the Replace with Format button. It will show a drop-down with two options – Format and Choose Format from Cell. You can either manually specify it by clicking on the Format button, or you can pick up an existing format in the worksheet by clicking on the cell that has it. Click on the Replace All button. You can use this technique to replace a lot of things in formatting. It can pick up and replace formats such as background color, borders, font type/size/color, and even merged cells. What do you do when you have to go to a new line in an Excel cell. You press Alt + Enter. And what do you do when you want to revert this? You delete it manually.. isn’t it? Imagine you have hundreds of line breaks that you want to delete. Deleting each one manually would take ages. Here is the good news, you don’t need to do this manually. 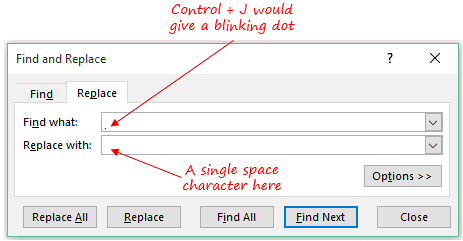 Excel Find and Replace has a cool trick up its sleeves that will make it happen in a snap. Select the data from which you want to remove the line breaks. Find What: Press Control + J (you may not see anything except for a blinking dot). Replace With: Space bar character (hit space bar once). And Woosh! It would magically remove all the line breaks from your worksheet. This one saved me hours. I got a list as shown below, and I had to remove the text between parenthesis. If you have a huge data-set, removing the parenthesis and the text between it can take you hours. But Find and Replace in Excel can do this in less than 10 seconds. Note I have used an asterisk, which is a wildcard character that represents any number of characters. Replace With: Leave this Blank. I hope you find these tips helpful. If there are any other tricks that helped you save time, do share it with us!! 24 Excel Tricks to Make You Sail through Day-to-day work. 10 Super Neat Ways to Clean Data in Excel Spreadsheets. 10 Excel Data Entry Tips You Can’t Afford to Miss. 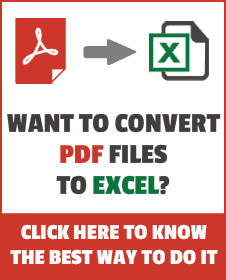 Suffering from Slow Excel Spreadsheets? Try these 10 Speed-up Tips. How to Transpose Data in Excel. Sumit. This is a great blog indeed. I downloaded your super-useful ebook, then came here to explore more and more useful tips. Thank you so much for taking the time to write, illustrate and share your valuable experience. This is noble indeed. Sumit, you’re right this is a great post! Thanks! Great Tips Thank U sir! Great stuff, I can still remember when I first discovered that I could use Find/Replace to modify formulas. Changed my life! I use Find/Replace the most when updating file paths for external links to other workbooks. Great Tip Chris.. This would certainly save a lot of time! Dave.. You gave me the idea and I tried something different to do the same thing (to copy references). Sumit – Cool approach; very clever and quick. Just tested on a Mac (need to use control-U instead of F2). Works great!